Leonid "Leo" Hurwicz (August 21, 1917 – June 24, 2008) was a Polish-American economist and mathematician, born in Moscow. He originated incentive compatibility and mechanism design, which show how desired outcomes are achieved in economics, social science and political science. Interactions of individuals and institutions, markets and trade are analyzed and understood today using the models Hurwicz developed. To date, Leonid Hurwicz is the oldest Nobel Laureate, having received the prize at the age of 90. Hurwicz hired Evelyn Jensen (born October 31, 1923), who grew up on a Wisconsin farm and was, at the time, an undergraduate in economics at the University of Chicago, as his teaching assistant during the 1940s. They married in 1944 and later lived at a number of locations in Minneapolis, Minnesota, the last being on Edmund Boulevard near W. River Parkway S.. They had four children: Sarah, Michael, Ruth and Maxim. The University of Minnesota, the College of Liberal Arts launched the Heller Hurwicz Institute, a new global initiative in the College of Liberal Arts at the University of Minnesota created to inform public policy by supporting and promoting frontier economic research and by communicating our findings to leading academics, policymakers, and business executives around the world. The Institute will be housed in our department. Funds raised by the Institute will be used to attract and retain preeminent faculty and, in part, to support graduate student research. Hurwicz, Leonid (December 1945). "The theory of economic behavior". The American Economic Review (American Economic Association via JSTOR) 35 (5): 909–925. JSTOR 1812602. Exposition on game theory classic. Hurwicz, Leonid (April 1946). "Theory of the firm and of investment". Econometrica (The Econometric Society via JSTOR) 14 (2): 109–136. JSTOR 1905363. doi:10.2307/1905363. Hurwicz, Leonid (July 1947). "Some problems arising in estimating economic relations". Econometrica (The Econometric Society via JSTOR) 15 (3): 236–240. JSTOR 1905482. doi:10.2307/1905482. Also available as: Hurwicz, Leonid; Arrow, Kenneth J. (1977). "Appendix: An optimality criterion for decision-making under ignorance". (online book) (Cambridge Books Online): 461–472. doi:10.1017/CBO9780511752940.015. Hurwicz, Leonid (May 1969). "On the concept and possibility of informational decentralization". The American Economic Review, special issue: papers and proceedings of the eighty-first annual meeting of the American Economic Association, (centralization and decentralization in economic systems) (American Economic Association via JSTOR) 59 (2): 513–524. JSTOR 1823704. Hurwicz, Leonid (May 1973). "The design of mechanisms for resource allocation". The American Economic Review, special issue: papers and proceedings of the eighty-fifth annual meeting of the American Economic Association, (Richard T. Ely Lecture) (American Economic Association via JSTOR) 63 (2): 1–30. JSTOR 1817047. Hurwicz, Leonid; Radner, Roy; Reiter, Stanley (March 1975). "A stochastic decentralized resource allocation process: Part I". Econometrica (The Econometric Society via JSTOR) 43 (2): 187–221. JSTOR 1913581. doi:10.2307/1913581. Cowles Commission Discussion Paper: Economics No. 2112, (pdf). Hurwicz, Leonid (May 1995). "What is the Coase Theorem?". Japan and the World Economy (Elsevier) 7 (1): 49–74. doi:10.1016/0922-1425(94)00038-U. ^ Lohr, Steve (2007-10-16). "Three Share Nobel in Economics for Work on Social Mechanisms". The New York Times (The New York Times Company). Retrieved 2007-10-19. ^ a b c d Higgins, Charlotte (15 October 2007). "Americans win Nobel for economics". BBC News. Retrieved 2007-10-15. ^ a b Ohlin, Pia (15 October 2007). "US trio wins Nobel Economics Prize". Agence France Presse. Retrieved 2007-10-15. ^ a b c d e Hughes, Art (15 October 2007). "Leonid Hurwicz—commanding intellect, humble soul, Nobel Prize winner". Minnesota Public Radio. Retrieved 2007-10-15. 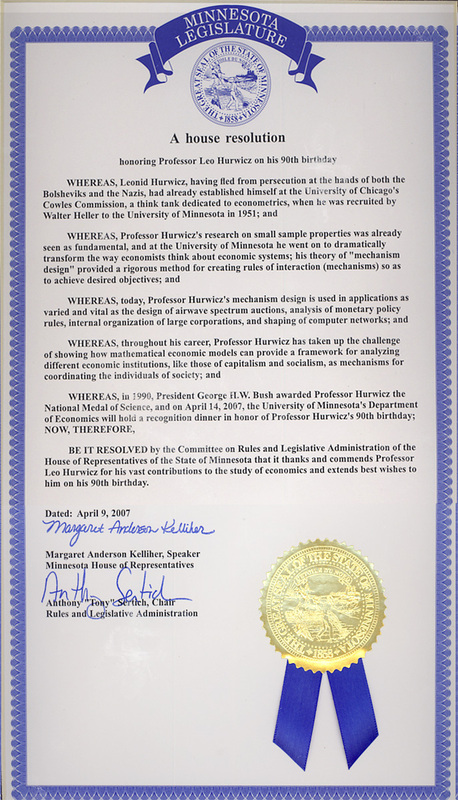 ^ a b c "A house resolution honoring Professor Leo Hurwicz on his 90th birthday". Legislature of the State of Minnesota (image via University of Minnesota, umn.edu). 9 April 2007. Archived from the original on 2007-10-25. Retrieved 2007-10-16. ^ a b c d e Clement, Douglas (Fall 2006). "Intelligent Designer" (PDF). Minnesota Economics (Department of Economics, University of Minnesota College of Liberal Arts): 6–9. Archived from the original (PDF) on 2007-10-25. Retrieved 2007-10-16. ^ a b c Horwath, Justin (16 October 2007). "U economics prof awarded Nobel Prize". The Minnesota Daily. Archived from the original on 2008-01-06. Retrieved 2007-10-16. ^ a b c d e f g h i "Perspectives on Leo Hurwicz, A Celebration of 90 Years (timeline)" (PDF). University of Minnesota (econ.umn.edu). 14 April 2007. Archived from the original (PDF) on 2007-10-25. Retrieved 2007-10-16. ^ a b c d "Five-Year Report, 1942–46, XII. Biographical and Bibliographic Notes". Cowles Foundation, Yale University. 1942–1946. Archived from the original on 2007-06-15. Retrieved 2007-10-16. ^ Ransom, Greg (15 October 2007). "Hurwicz Took Part in the Mises Seminar". Mises.org Weblog, Ludwig von Mises Institute. Retrieved 2007-10-16. ^ Chiacu, Doina (Reuters) (15 October 2007). "Russian-born U.S. economist oldest-ever Nobel winner". Reuters Group. Retrieved 2007-10-15. ^ "Report for 1942". Cowles Foundation, Yale University. 1942. Retrieved 2007-10-16. ^ Simon, Herbert A. (28 September 1998) . An Empirically-Based Microeconomics (Raffaele Mattioli Lectures). Cambridge University Press. p. 193. ISBN 0-521-62412-6. ^ "Report for 1950–1951". Cowles Foundation, Yale University. 1951. Archived from the original on 2007-06-25. Retrieved 2007-10-16. ^ "Cowles Foundation for Research in Economics: Staff Lists, 1955–Present". Yale University. Retrieved 2007-10-20. ^ "University of Minnesota Professor Leonid Hurwicz wins Nobel Prize in economics" (Press release). Regents of the University of Minnesota. Retrieved 2007-10-15. ^ "Major Works of Leonid Hurwicz". The history of Economic Thought. cepa.newschool.edu. Retrieved 2007-10-15. ^ a b c Morrison, Deanne (15 October 2007). "University professor wins Nobel Prize". UMN News, Regents of the University of Minnesota. Retrieved 2007-10-15. ^ Myerson, Roger B. (2007-02-28). Fundamental Theory of Institutions: A Lecture in Honor of Leo Hurwicz (PDF). University of Chicago. p. 2. Retrieved 2007-10-15. . Hurwicz Lecture originally presented at the North American meetings of the Econometric Society, at the University of Minnesota on 2006-06-22. ^ Hurwicz, Leonid and Reiter, Stanley (22 May 2006). Designing Economic Mechanisms. Cambridge University Press. pp. Frontmatter (PDF) via Cambridge University Press. ISBN 0-521-83641-7. Retrieved 2007-10-16. ^ "Academic Exchange with Foreign Institutions". Huazhong University of Science and Technology School of Economics. Archived from the original on 2007-08-08. Retrieved 2007-10-16. ^ a b c Zappia, Carlo and Basili, Marcello (May 2005). "Shackle versus Savage: non-probabilistic alternatives to subjective probability theory in the 1950s". Quaderni (Università degli Studi di Siena, Dipartimento di Economia Politica) (452). Retrieved 2007-10-19. ^ a b Jaffray, Jean-Yves and Jeleva, Meglena (16–19 July 2007). "Information Processing under Imprecise Risk with the Hurwicz criterion" (PDF). International Symposium on Imprecise Probability: Theories and Applications (conference proceedings via sipta.org). Retrieved 2007-10-19. ^ Wald, Abraham (1950). Statistical Decision Functions. John Wiley & Sons. ^ Kramer, Edna Ernestine (1982). The Nature and Growth of Modern Mathematics. Princeton University Press via Google Books limited preview. p. 290. ISBN 0-691-02372-7. Retrieved 2007-10-19. ^ "The Sveriges Riksbank Prize in Economic Sciences in Memory of Alfred Nobel 2007" (Press release). Nobel Foundation. October 15, 2007. Retrieved 2007-10-25. ^ "Leonid Hurwicz – Interviews". Nobel Foundation. October 15, 2007. Retrieved 2007-10-25. ^ a b Tong, Vinnie (Associated Press) (15 October 2007). "U.S. Trio Wins Nobel Economics Prize". Forbes.com (Forbes). Archived from the original on 2007-10-17. Retrieved 2007-10-15. ^ Bergman, Jonas and Kennedy, Simon (15 October 2007). "Hurwicz, Maskin and Myerson Win Nobel Economics Prize". Bloomberg L.P. Retrieved 2007-10-15. ^ "Russian-born Nobel Prize winner lives in nursing home". Russia Today (TV-Novosti). 19 October 2007. Retrieved 2007-10-19. ^ Walsh, Paul (2007-12-10). "U professor to receive his Nobel Prize today". Minneapolis Star-Tribune. Retrieved 2007-12-10. ^ Art Hughes (2007-12-10). "Minnesota's newest Nobel Laureate receives his prize". Minnesota Public Radio. Retrieved 2007-12-10. Clement, Douglas (Fall 2006). "Intelligent Designer (cover story)" (PDF). Minnesota Economics (Department of Economics, University of Minnesota College of Liberal Arts): 6–9. Archived from the original (PDF) on 2007-10-25. Retrieved 2007-10-16. "Intelligent design". The Economist (The Economist Group). 18 October 2007. Retrieved 2007-10-18. Cho, Adrian (15 October 2007). "The Economics Nobel: Giving Adam Smith a Helping Hand". ScienceNOW Daily News (American Association for the Advancement of Science). Retrieved 2007-10-19.